Autofurnish Noodles Car Foot Mats are made to last like no other car mats. There is no dust on the surface, hence no dust will get into the A/C when it is in the air re-circulation mode. Autofurnish Curly Car Foot Mats protects the Foot of your car and can ensure that it looks great for many years to come. 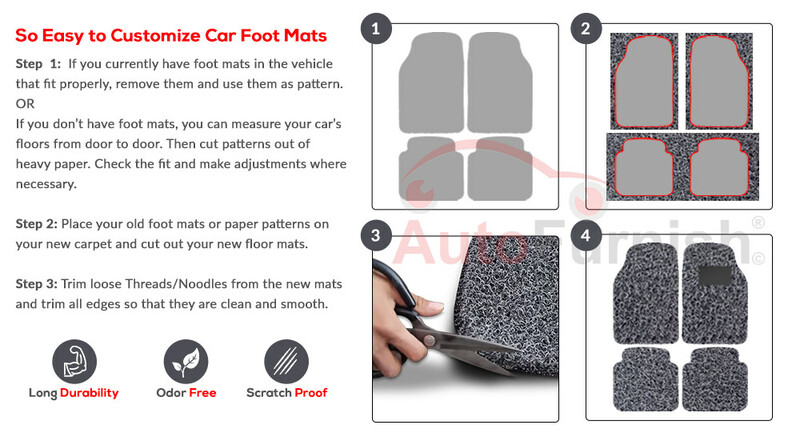 Autofurnish Noodles Car Foot Mats are made to last like no other car mats. They are well known for their superb performance and durability. They last for years and the value that you will experience with these mats is unrivalled by others. The mats are anti-skid and also provide a cushion feeling to our feet while sitting in the car. Dust trapping capacity. Daily shoe dirt will get trapped into the inner layers of the mat. Nothing is visible on top, so the mats have a clean appearance for a long time. Water/Liquid trapping capacity is good. Even fluids will get trapped in the inner layers of the mat. Individual mat piece can be removed and tilted to eject the impurities later at your leisure. It will not spill off on its own. Once dust and liquids are absorbed into the mats, nothing stays on the top surface. This prevents the wet rubbery sounds that come from moist shoes. There is no dust on the surface, hence no dust will get into the A/C when it is in the air re-circulation mode. Snug fit of the mats in the footwall area means they will not slip and slide too much with foot pressure. Washing the mats is simple since it is made of a kind of rubber material. Spongy, cushioned feel for the feet when resting them on these mats increases comfort.